Volkswagen has revealed a glimpse of the company’s future mobile quick charging station. The mobile charging station works according to the principle of a power bank and VW says it can be set up flexibly and independent of the power supply wherever it is needed: for example, in public parking lots in the city, on company premises, or as a temporary charging point at large-scale events. The charging capacity of up to 360 kWh enables up to 15 electric vehicles to be charged in stand-alone operation and, with quick charging technology, the charging process only takes 17 minutes on average. If the energy content of the integrated battery set is less than 20 percent, the depleted charging station is exchanged for a charged one. If, however, it is permanently attached to the power supply with up to 30 kW via alternating current, the battery pack perpetually recharges itself. If the charging process is based on renewable power supply, the charging station allows the temporary storage of sustainably generated power. 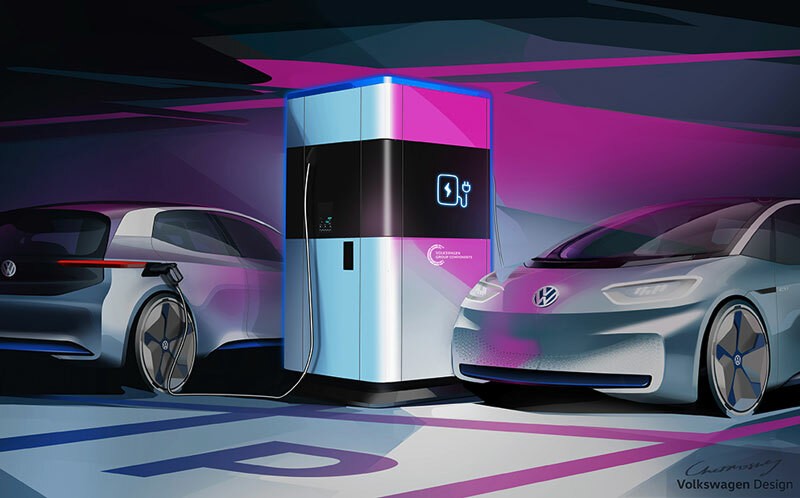 VW says the first mobile quick charging stations will be set up as early as the first half of 2019 in the company’s hometown as part of a pilot project. As of 2020, the charging station will also be implemented in other cities and communities. In addition to electric cars, e-bikes can also be charged and up to four vehicles can be charged simultaneously: two with DC and two with AC connections. There is also the possibility of connecting to the power supply directly, allowing the station to be charged with up to 30kW via alternating current by means of a permanent standard grid connection. This enables charging points for electric vehicles to be set up quickly and simply, without any structural changes or major financial outlay. VW says the battery pack in the charging station can be recharged around the clock thanks to the direct power connection.